CITICSat, who holds the exclusive right to market AsiaSat's transponder capacity in Mainland China, took part in the 2016 CCBN exhibition. In this month, AsiaSat participated in CABSAT 2016 in Dubai and CASBAA India Forum 2016 in New Delhi. Come and check out the insights shared by our leaders there. AsiaSat has successfully completed the launch vehicle PDR for AsiaSat 9 in Moscow at Khrunichev facility. Dec 2015, the employees of AsiaSat flocked together and celebrated the year end carnival they deserved after a whole year's hard work. Selected from the many creative ideas of AsiaSat staff, the winner - Catherine Chang, General Counsel of AsiaSat, was presented an award for her creativity and ingenuity. Alan Wong, Manager of Sales Solutions from AsiaSat gave a presentation on Ultra-HD (UHD) broadcasting via satellite and our recently announced "4K-SAT" channel to broadcast and media practitioners last week. 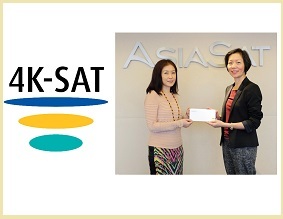 AsiaSat just excitedly introduced the new free-to-air Ultra HD channel “4K-SAT” and new deals at October's Asia-Pacific TV events: the CASBAA Convention 2015 in Hong Kong and the ABU GA and Associated Meetings in Istanbul, Turkey. Teletimes’ September 2015 issue publishes an exclusive interview with William Wade, President & CEO of AsiaSat. He elaborated the rationale behind the latest rebrand campaign and the key focus of AsiaSat services. Also about AsiaSat’s UHD initiative, and new market trends that are shaping the satellite industry . The bi-propellant tanks installed inside the central cylinder, AsiaSat 9’s main body. What’s next? In preparation for propulsion subsystems testing!